I have implemented a thoroughly worthwhile modification on my Turbo R, SCBZSOTO9HCH20037, which has dramatically improved the performance of the window lifts from being mediocre and unacceptable to outstanding. This is so successful that I am posting this publicly. Wow. Thundering windows alright !! This modification is a MUST. I have never been so pleased with such an easy modification. It took about 15 minutes to prepare each of five modules, and 20 minutes to fit each to the car. 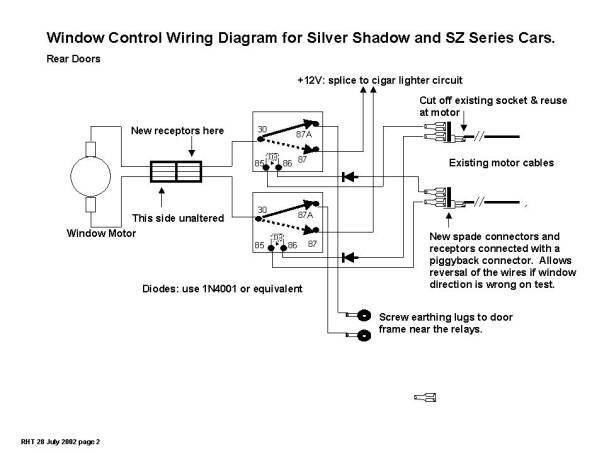 The reason for all this is that, in order to save weight, R-R used very thin wire on the window circuits, in my opinion only thick enough to power the clock. From memory, R-R toyed with the idea of using a ring main on the SZ cars, but backed off and simply continued to use thin wires as on the later Silver Shadows. Being a car just prior to Chassis 13754, the windows on our '72 T-Series are just superb, but the Turbo R's were just embarrassingly slow. 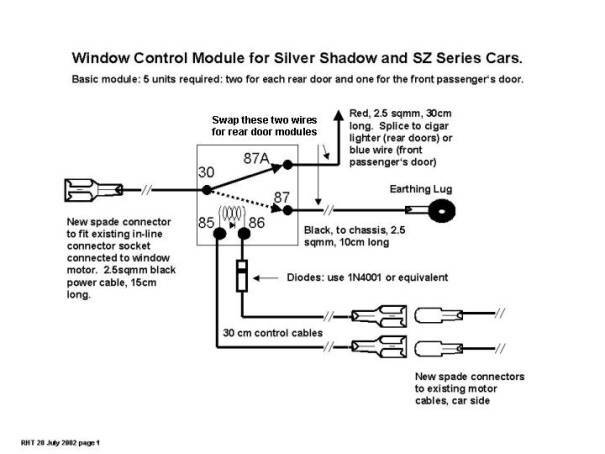 Many SY and SZ series cars are now suffering slow windows as the wiring ages, and those cars benefit enormously from this modification. 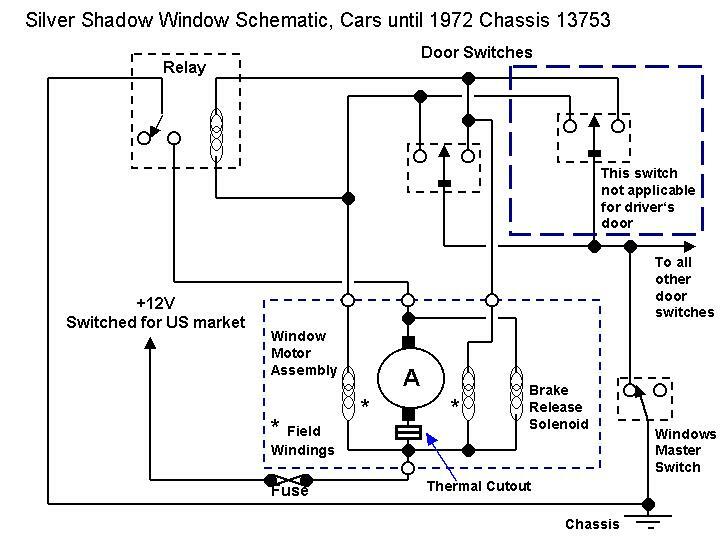 Note that SY cars like ours, before chassis 13754, have a completely different electrical circuit design for the windows, and incorporate relays from new. That is the reason why the earlier SY cars suffer far less than the later cars. From SY chassis 13754, thinner wires were applied and the relays deleted. The window motors also switched from the earlier 4-wire dual field direction control motors to two-wire, permanent magnet motors. From then on, motor direction is controlled by reversing the armature polarity. 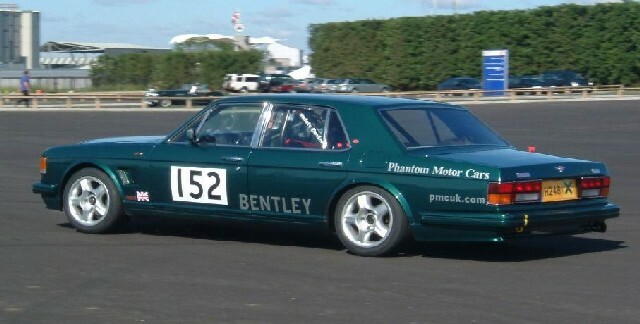 SZ cars from Chassis 30000 have an ECU and relays, but retain the two wire system. So, the following only applies to the cars listed in the title. relay to remedy this. My driver's door was OK, but the other three left somewhat to be desired of this fine beasty of a car. 1 general purpose power diode, type 1N4001, 1N4004, 1N4007, EM513 or equivalent. 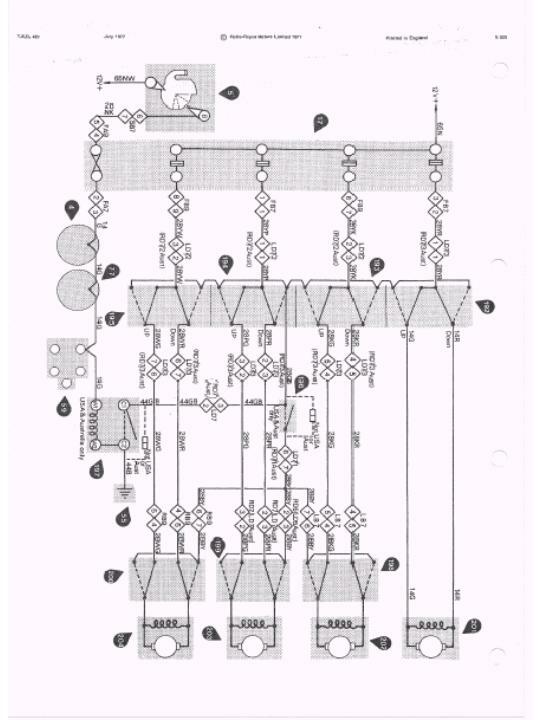 One issue addressed here using the original R-R equipment Bosch type of relay, and many other brands too: you must insert a diode before each relay coil. In the configuration I chose, it is essential. In the other possible configuration, with the relay + coils connected to the cigar lighter circuit, there is potential to reverse bias the coil slightly on the de-energised relay when the power supply (cigar lighter) is on load. This potential can easily be enough to blow the diode suppressor inside if an external diode is not fitted. Incidentally, this extra diode even simplifies installation , as all five modules are identical. By the way, on the rear doors you will notice that I implemented the configuration such that the motor is normally at zero volts, not sitting with both terminals normally live as originally they were. I have an aversion to leaving electrical devices permanently live. To do this job, I opened up a rear door to see the arrangement, designed the simple layout, made two modules up in the workshop, and then installed them. The slowest window is now the driver's !!! The solution on the passenger side works amazingly well, and the windows are now as fast as any new car. 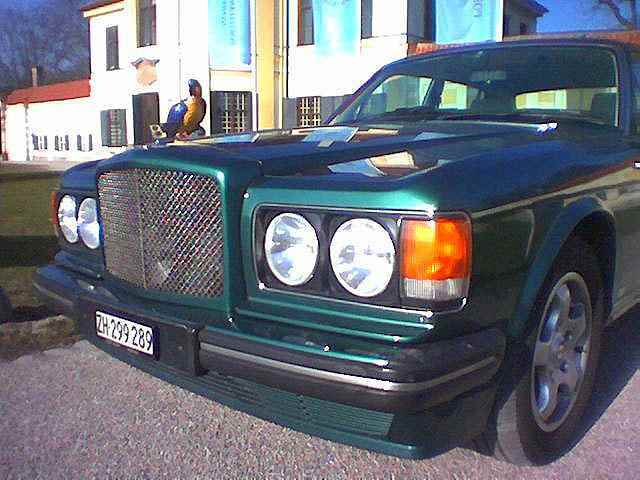 The rear doors each have a high current supply for the cigar lighters available, but the front ones do not, so a half solution improving the grounding on the passenger's door is the only easy one, but it gives a 100% result anyhow. My LH rear window was inoperative from the driver's door because of the poor conductivity, but now zips up and down like a new one. 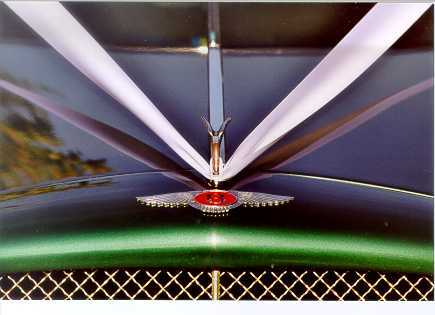 It had 4 volts across the motor terminals when operated locally, and 2 volts when operated from the driver's door. I used 2.5 sq.mm power automotive cable for the power side of the mod. The front passenger's door uses one module, the rear doors two each. existing socket fitted to the car, I fitted new spade receptors. To do this, cut the existing motor supply wires at the socket and remove the old receptors. 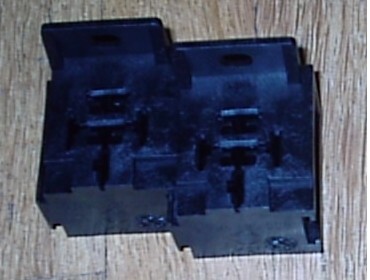 Use a pair of identical spades and sockets to connect the existing pair of wires to your new relay set, so that if the motor direction ends up incorrect you may reverse them. four windows at once and the fuse did not blow. E-mail me so I can E-mail them as jpeg files. You may also right click on any image to download it. 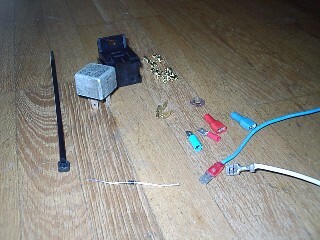 Note that replacement window lift microswitches, where required, must be DC rated. A suitable microswitch is the Omron V-21-1C6 , available at any industrial electrical supplier. This switch is ideally rated 21A at 250VAC, and 18 A at 14VDC. 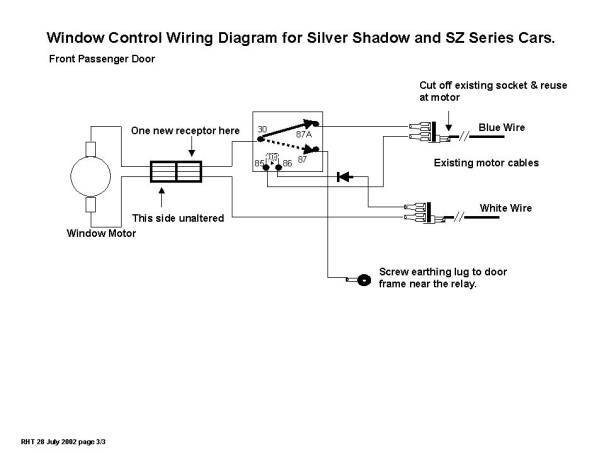 NOTE: On some cars (Silver Shadows for example), the wires to the window motors are yellow and yellow/black. On others they are blue and white. This does not change the configuration in any way. Just about any brand of relay will do as long as it is a 12V changeover type (double pole, single throw) as used extensively in every motor vehicle produced. Below is a picture of the Bosch type, and also an equivalent pin-for-pin compatible aftermarket brand. All relays with pinouts 30, 85, 86, 87 and 87a are electrically and functionally identical, but may have either a diode or conventional suppressor. With the configuration proposed above, it is irrelevant whether the relay contains a diode or a conventional suppressor. Schematic for Later SY Cars from Chassis 13754, and SZ Prior to Chassis 30000. The Relay Is for US and Australian Cars. Other Cars Have the Bridge (Shown Dotted) Installed Instead. The configuration that I have chosen is no accident, and will only work with the diodes in place. On the front passenger's door, it is impossible to delete the diode without running a new wire through to the door innards. 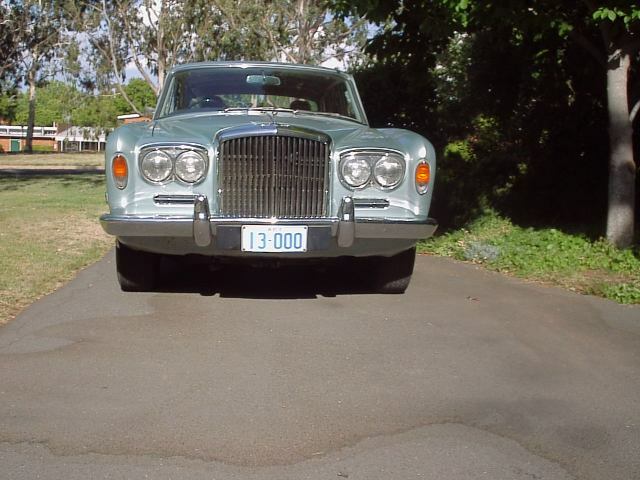 In that case, you would fit two relays anyhow, as on both rear doors. In each case, the relay picks up when the potential difference between the control wires is 12V and of the correct polarity. The diode is the simple logic device to allow the relay to pick up only when it should, and also to protect the relay suppressor as explained below. With a reconfiguration, it is marginally possible to delete the diodes on the rear doors only, but it is unwise. Diodes only cost 10c or so anyhow. Any general purpose power diode like a 1N4001, 1N4004, 1N4007 or EM513 is fine. 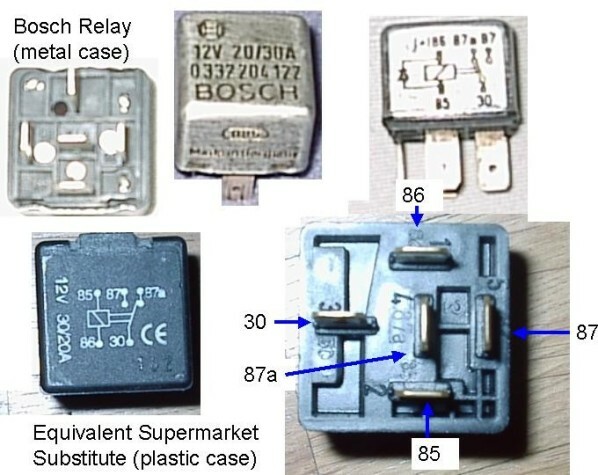 Most Bosch relays, and other brands too, use a freewheel diode as a suppressor (stops voltage spikes which cause radio noise and damage electronics). When even the substantial cigar lighter power cable is used as a trunk feed as on the rear doors, there is a certain voltage drop on load. This trunk wire would need to be used as the reference voltage for both relays on the + coil terminal in a reconfigured setup. This means that the relay not being activated would have a reduced reference voltage while the window is working or the cigar lighter is being used. As the other side of the coil would remain at +12V as fed unloaded from the driver's door, the relay coil would have a slightly reversed voltage. Anything above 0.6V reversed will burn the freewheel diode inside the relay to bits as it starts to conduct. Given that you expect a voltage drop of up to 2V, the Bosch relay would not survive. Even using a cheaper bipolar relay with a conventional suppressor, it would be very bad practice to allow this reversed voltage situation. In worst case, both relays may try to pick up, and then give either no function or buzzing. Now, you would not want the windows to shift or fail just because someone presses the cigar lighter would you ? Conceivably, other loads (headlamps, fans etc) could cause the same effect. Definitely, winding two windows at once would be risky without the simple insurance of the diodes. It's best to fit the diodes, even if you decide on a different schematic. Beware ! Has your Silver Shadow, Silver Shadow II or Derivative Had Its Final Drive Crossmember Reinforced Yet ? Has a Plate Been Fitted to the Boot Floor ? If the window lifts are slow, it doesn't matter to me on my Turbo R !